As with her previous two novels, Megan Abbott’s latest explores the complex world of teenage girls. Like those books, The Fever places its young heroines at the front and center of a fascinating story from which everyone can learn something. Megan Abbott has never been a writer who talks down to her audience; she rightfully expects that those who are reading her books are able to extrapolate from her words what they themselves want or need from her particular brand of crime fiction. The Fever documents a community if a panic after the turmoil created when a series of young girls are afflicted with a strange condition – a condition which causes their limbs to contract involuntarily, their speech to slur, and their memory to falter. Megan Abbott tells this tale through the lens of one family who resides at the heart of the community in question. The Nash family is comprised of father, Tom Nash; older brother, Eli Nash; and younger sister, Deenie Nash. With each of these characters, readers will watch as they are changed in different ways by the confusing situation happening around them. Tom Nash teaches at the local school – the site of many of the unexplained incidents affecting certain girls. By effectively dealing with his wife’s affair and subsequent abandonment of their family, Tom represents a logical authority figure to whom folks will turn in a crisis. However, he is not infallible and his knowledge about many things happening around him remains limited. Hockey star Eli Nash can have any girl that he wants. And he often does. Since these girls are practically throwing themselves at the handsome and stellar athlete, he has never really needed to understand the females he surrounds himself with. Yet, as he watches his younger sister mature, and her friends struggle with multiple things (including the fear of this unexplained phenomena), Eli begins to realize that perhaps he really doesn’t understand anything about life. Lastly, there is Deenie Nash. Not only is Deenie friends with all of the girls who have been afflicted by this medical mystery, but now she must also deal with the eyes of suspicion that look her way. Making matters worse, just the night before the first incident, Deenie made a major life decision and now she has no one to talk to about it. Fearing that she could be next or that maybe she did do something to cause this hysteria, leads Deenie to seek out the truth – regardless of the consequences. Megan Abbott once again successfully taps into the mindset of these teenagers. Readers will easily remember their youth, when everything that happened seemed monumental. These girls are dealing with real moments (such as losing one’s virginity or the trauma brought about by parental abuse), while also navigating the chaos of lesser important events (like a friend defecting to another clique) which seem significant at the time, but which are really only distractions and lessons to be learned from. Meanwhile, over this one week period that Abbott focuses on, the adults seems to forget the children who are at the core of the mystery and instead search for a place to focus blame. Everything from drugs, vaccines and pollution are proposed as possible sources of the contagion by the adults in power; all the while forgetting that these victims are young girls who are confused, frightened, and in need of comfort. Regardless of where the blame lies – whether it be profound or mundane – these girls will never be the same, and neither will the town in which they reside. 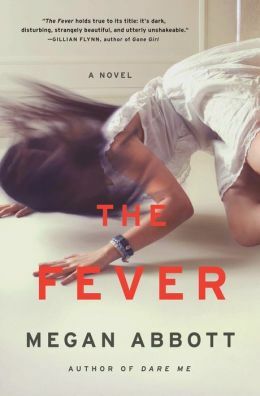 Megan Abbott’s The Fever is about so much more than just the tragic medical mystery that grips the town. By showing readers one family in which two children are negotiating the throes of adolescence in the shadows of this much larger crisis, Abbott is able to make some profound observations about the act (and art) of growing up in our modern society. _____________________________________________________________________ Disclaimer: A print galley of this title was provided to BOLO Books by the author. No review was promised and the above is an unbiased review of the novel. I’ve been waiting for this review!! As I’ve mentioned to you, I fell in love with her when listening to her audio books. I didn’t know about her publishing company’s dispute with Amazon, though. I will have to find an independent online retailer. Thanks, as always, for a great review. I’m sure I’ll send you an email when I’m reading it! The Hachette/Amazon situation is very unfortunate. I feel most bad for those authors who are caught up in it through no fault of their own. Barnes and Noble was running a sale on The Fever (and possibly other Hachette books) as are many online indies. Pre-sales would really help at this stage, so thank you for your support. We need to send the message that the consumer should have access to the books they want. The book deserves to find a wide audience.